Last month, I took part in Oregon State University’s online permaculture class, taught by Andrew Millison. While permaculture design certificates can cost upwards of $750, this class was free, open to the public, and available to access from anywhere. It was pretty inspiring to see people from all over the world engaging in the discussions – some of them with very specific plans for how they could apply these principles to their own farms and homesteads. One of the topics featured in the course was the concept of watershed management. Pretty much every location that you might apply permaculture principles to is part of a watershed basin. But our watersheds – regions that share a common water drainage system – don’t correspond neatly to property lines or political boundaries. An organic farm on one property may be compromised by the flow of chemicals from a different plot of land somewhere else in the watershed. Part of permaculture design means being aware of these impacts on your watershed. In some regions, watershed councils work together to restore habitats and monitor drainage patterns. In other regions, management is less intentional: water is transported from miles away to irrigate farmland, or to support urban populations in drier regions. Many U.S. states were created with rivers as boundaries, meaning that watershed management can fall under the jurisdiction of two state governments — one on each side of the river — making it even more difficult to care for properly. What would look like if our states were organized by watersheds, rather than by political boundaries? 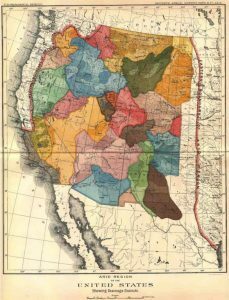 In 1879, one man proposed just such a thing: John Wesley Powell, the second director of the U.S. Geological Survey, designed a map showing the drainage districts of the Western half of the country. He proposed that all new states be incorporated along these boundaries, rather than those preferred by agricultural interests. Powell’s plan was never adopted, but his vision — that decisions about land use must be based on how we use water — may finally be catching on. In California alone, two documentaries are exploring the impact of the L.A. Aqueduct, which transports water over 300 miles — supplying drinking water to Angelenos while exacerbating the drought in far-off Owens Valley. Which watershed do you live in? What rivers feed into it, and which bay or delta does it drain into? If you don’t know, check out this searchable map from the U.S. Geological Survey. You can click on your region and subregions all the way down to your local watershed.